"I Had a Hard Time Praying to the Theotokos"
In response to my blog entry called The Tongs, someone has asked me if, as a convert to Orthodoxy, I had a hard time at the beginning praying to the Theotokos. The answer is yes. In my whole-life confession the week before I was received into the Holy Orthodox faith, I confessed to the priest that I had a hard time praying to the Theotokos. I told him that I had no problem with the theology related to the intercession of the Saints, nor with the special place of the Mother of God in the dispensation of salvation and as an intercessor. My problem was that I just couldn’t do it. I could say the words of the prayer–O Lady, Bride of God, spotless, immaculate Virgin…–but the words had no meaning for me. I felt no connection. The wise priest told me not to worry about it, She’d make the connection. Because I converted with a community (there were 85 of us), I was ordained a deacon on the day of my chrismation. 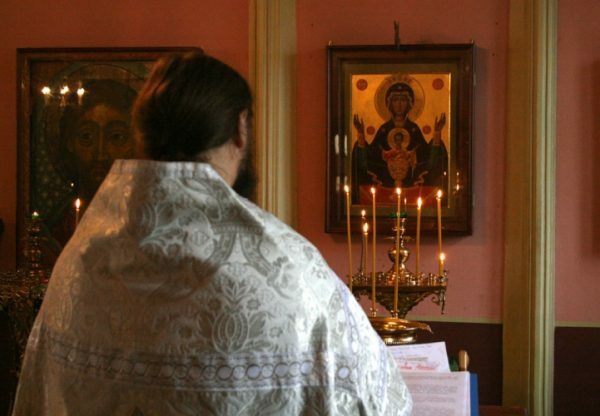 And so I served as a deacon for about three years before she “made the connection.” For the first three years, standing in front of the icon of the Mother of God during the first part of the Divine Liturgy, I basically felt a blank inside my heart. I even had a hard time venerating the icon, finding myself always kissing the foot of Christ in Her arms, and not Her. (I’d be too ashamed to confess it now, except that it magnifies the greatness of the Love and patience of the Mother of God for those who are being saved.) I said the prayers to the Mother of God faithfully, but with no feeling. I often found myself trying to figure out what the words “meant,” as though that would help me find a connection. Then one day a miracle happened. I was going through a particularly stressful season of financial worry. The stress was crushing me. During the Divine Liturgy one Sunday, while standing before the icon of the Mother of God, I asked Her for help. I don’t remember what I prayed, but I remember what happened. I heard a voice in my head. The exact words are lost, but the gist was this: you won’t have to worry about money again. The words were accompanied by a very peaceful feeling, almost like an untying of knots inside me. The feeling stayed with me for several days. Within a few days, there was a change in my circumstances that delivered me from the immediate cause of my financial worries. Since that time, whenever I am tempted to worry about money, I stand before the icon of the Mother of God and remind Her (remind myself really) of the words I believe She spoke to me. And the miracle is that I don’t worry. Financial ups and downs come and go, but the miracle is that She has freed me from worry. Praying to the Mother of God, I have come to know in some small ways the Mother of God. She is our heavenly Mother. I know Protestants will freak out about that kind of language–I certainly would have–because they have no categories for divine-human synergy. But just as God distributes his gifts through the free will of his people on earth, so He also distributes His gifts through the intercessions of the Saints who are in heaven, especially the Mother of God. When my daughter Hannah was 16, she wanted to work at Barbara Cheatley’s, an exclusive gift shop in a little high-end shopping area in Claremont, California. My daughter prayed fervently that she would get a chance to work there. Then she spoke to Barbara, but Barbara told her that there were no openings and she expected no openings: all of her “girls” had worked for her for fifteen years or more. Hannah was crushed when she told us the news. My wife, however, was not ready yet to give up so easily. Bonnie and the Barbara had been business associates for several years and had developed a friendship. Bonnie went to her and “interceded” on Hannah’s behalf. Eventually, after much intercession that may have sounded somewhat like nagging, Barbara agreed that if Hannah could learn to wrap packages well (and the gorgeous wrapping is one of the big reasons why people keep coming back to Barbara Cheatley’s), she could work in the back room for the two months leading up to Christmas. Hannah learned to wrap packages “Barbara’s way,” and she worked two exhausting months for minimum wage at Barbara Cheatley’s. God answered Hannah’s prayers through the intercessions of her mother (and my wife ☺). God often pours out his Grace to us through others, by the intercessions of others. It should be no surprise then if, when we are in trouble, we find help in the intercessions of God’s Mother. The Grace is God’s, the intercession is His Mother’s, the help is from both. God works synergistically with and through His people.